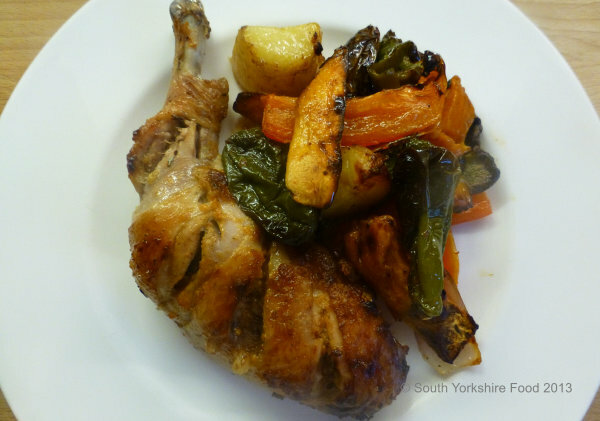 Crispy, spicy, and succulent chicken that marries beautifully with the flavoursome roasted vegetables. The Padrn chillies give a background hint of spiciness, and a subtle heat. Serves 4. In a food processor whiz two of the garlic cloves, with the sweet chilli sauce and 1 tbsp olive oil to make a thick marinade. Coat the chicken portions with the marinade mixture and leave to marinade in the refrigerator for at least two hours. Heat the oven to 200°C/Fan 180°C/ gas 6. Put all the vegetables in a baking tray and coat with the remaining olive oil. Sprinkle with sea salt and black pepper and mix well. Place the chicken joints on top of the vegetables, sprinkle with some more salt, and bake in the oven for 20 minutes. Turn the chicken joints over and give the vegetables a mix around. Cook for another 20-30 minutes until the chicken is crisp and the vegetables roasted. Serve a portion of chicken per person with a serving of vegetables, and any juices from the baking pan spooned over the chicken.